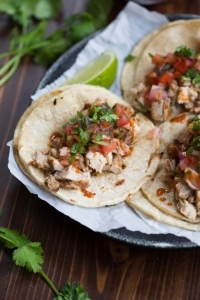 Marinated chicken thighs are grilled to perfection and served with warmed corn tortillas, pico de gallo, and cilantro. Make chicken marinade by combining all marinade ingredients in a large ziplock bag. Add chicken thighs. Refrigerate for at least 1 hour or up to overnight. Preheat grill over medium-hight heat. Oil the grill with canola oil or spray generously with cooking spray. Remove chicken with marinade and place on hot grill. Cook for about 4-5 minutes on each side, flipping once (thickest part of the chicken thigh should register about 165 degrees). Transfer to a plate and allow to rest for a few minutes before chopping into small pieces. Layer two warmed mini corn tortillas together. Top with chopped chicken, pico de gallo, cilantro, hot sauce, and sour cream (optional). Spritz with a little bit of lime juice. Serve immediately. Serve with a side of Mexican Rice or another Mexican side dish.